Map courtesy of El Paso Natural Gas Co.
El Paso Natural Gas Company (EPNG) has requested US Federal Energy Regulatory Commission (FERC) authorization to make facility modifications at its existing Keystone Compressor Station and other facility locations in Winkler, Crane, and Upton Counties, Texas, USA. In addition, EPNG will construct a 14-mi. (22-km), 24-in. (609-mm) diameter loop line of its existing 20-in. (508-mm) diameter Line No. 3162 in Winkler County, Texas. The project will allow EPNG to provide up to 320,000 dekatherms per day of expansion firm transportation capacity from receipt points in the Permian Basin to delivery points in the Permian Basin. Keystone Compressor Station: Automate Mainline Valve (MLV) 1 located on Line No. 3026; remove an existing block valve, install new automated 24-in. valves to connect the new loop line to EPNG’s Line No. 1103; add a new cross-over line between Line No. 1103 and Line No. 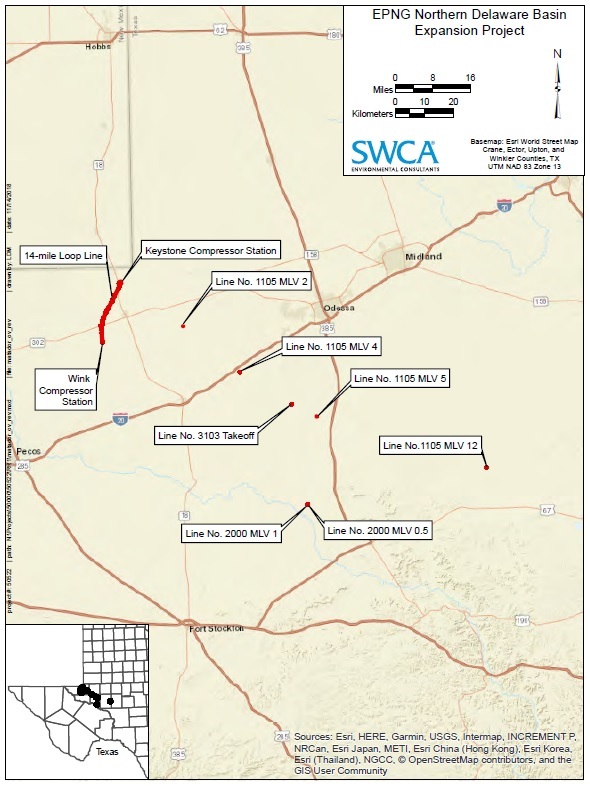 1105; and modify inline inspection facilities and other appurtenant facilities all within the Keystone Compressor Station in Winkler County, Texas. Wink Compressor Station: Automate existing station valves; install new automated 24-in. valves to connect the new loop line to EPNG’s Line No. 3162 and Line No. 2000; modify inline inspection facilities and other appurtenant facilities all located within the Wink Compressor Station in Winkler County, Texas. Line No. 31111: Construct an approximate 14-mile, 24-in. outer diameter loop line of its existing Line No. 3162 within Winkler County, Texas. Designated as Line No. 31111, the proposed loop line will extend from EPNG’s existing Keystone Compressor Station in a southerly direction to EPNG’s existing Wink Compressor Station and will predominantly parallel EPNG’s existing right-of-way for its existing Line No. 3162. Line No. 1105 Inline Inspection Facility: Modify two inline inspection facilities to facilitate bi-directional natural gas flow on Line No. 1105 located in Upton County, Texas.